You might have seen some animated short videos popping up on SpanishTown.ca over the last couple of months. As we learn and experiment you will likely see the quality improve. Our first videos were low resolution due to technical issues but we are now able to create them in full 1080p. The videos are hosted on YouTube where we have our own little channel started. We also embed them into the website either on new pages or with their corresponding vocabulary. If you are watching on YouTube then please subscribe and leave a comment. Let us know what works and what doesn’t so that we can improve them going forward. Some of the videos will focus on the basic vocabulary while others will be a little more advanced and contain short conversations. In this video a family discusses the items they need for a day of fun at the beach. This style of video that is a little more advanced and doesn’t have any translations embedded in the video itself. We are committed to producing more of these videos but they do take a considerable investment of time. Please subscribe on YouTube to the our channel. The more we see that number grow the more time we will be investing into producing new videos. The blog here has been languishing for quite a while but it is not because we haven’t been busy. In fact, we have been so busy that we had no extra time for the blog. Over the next few posts we will be going over some of the changes and additions that we have made to SpanishTown.ca. This was and continues to be a real challenge. We have redesigned almost all of our pages so that our visitors can have the best possible experience no matter what device or browser they are using. After testing on different devices, screens sizes, and browsers we are mostly confident that the site should work whether you use a smartphone, tablet or PC running Chrome, Safari, IE, Firefox or Opera. These browsers cover 94% of our visitors to SpanishTown.ca. We hope that you enjoy the site on whatever device you choose to use. The Christmas holiday season is fast approaching! Why not learn some basic Spanish vocabulary for this holiday season? We have just updated our Christmas vocabulary page. Stop by SpanishTown.ca and learn some new Spanish words for Christmas time. 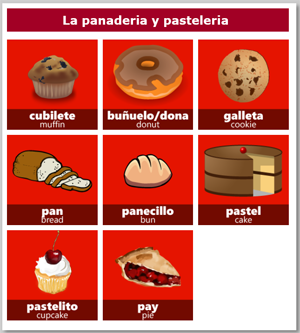 Our most recent update includes Spanish vocabulary for days of the week, months of the year and seasons. Start out by learning the Spanish names for the days of the week. We’ve added some additional phrases following the days of the week simulating your activities for the week. Try to come up with your own phrases for different activities that you are going to be doing. After you have finished learning the days of the week it is time to learn the months of the year. Tap or click on tile to listen in Spanish. Let’s talk about the seasons in Spanish. Learn the Spanish names for the seasons and then listen to some sample sentences talking about the seasons. We continue to make the website more accessible to touch devices with the redesigned pages for vehicles and transportation vocabulary in Spanish. Tap or click on a tile to listen to the pronunciation in Spanish. Practice with some short Spanish sentences that talk about vehicles. Try making up your own sentences with other vehicles and descriptions. We have just rolled out our updated Animals in Spanish section! Designed for touch devices and traditional computers, it is now accessible to more users. Remember to make sure you have updated your browser. Tap or click on some common animals to learn their names in Spanish. We’ve included a number of common animals that you might find around your house, at the farm or in the zoo. Learn animals in Spanish. Now that you know the names of some common animals in Spanish, learn some parts of the animals such as tail, claws, legs or snout. What would you call the horn of a rhinoceros in Spanish or the hooves of a horse? Learn the parts of animals in Spanish. The next step is to try and put all of this Spanish vocabulary together and form sentences to talk about animals in Spanish. Listen to these sentences in Spanish and then try and come up with own using a different animal, color or body part. Learn to form Spanish sentences that describe animals. Spanish Present Tense App: Over 5000 downloads!